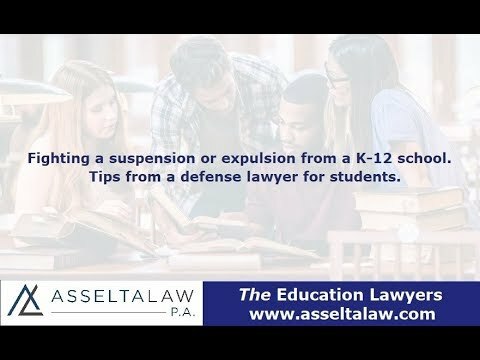 Tips for fighting a suspension or expulsion from a K-12 school. My child is facing a long-term suspension or expulsion from school. What should I do? Students of all ages make mistakes. Elementary, middle and high school students can be suspended or expelled for several reasons. If a student is suspended for more than 10 days or is recommended for expulsion from school, they must be given the chance to defend themselves. What should I say to fight the suspension or expulsion? Your defense strategy depends on the charges your child is facing. I wish I could give a step-by-step map to building a defense, but it really depends on the facts of the case. Generally speaking, you must make sure you gather all of the evidence the school is using to support the suspension or expulsion. You should also request all of your child's school records. Finally, make sure you appeal the discipline within the given time frame. What should I write about in my suspension or expulsion appeal? The formatting of each appeal depends on the reason the student was suspended or expelled. The appeal should explain the situation in a chronological order clearly. Think of how an outline is formatted. Can you help me fight the suspension or expulsion from school? Yes. I defend students in K-12 schools throughout the state of Florida. Each district approaches disciplinary issues differently, so it is important to have an attorney who specializes in this area of law. Click here to read what clients are saying about Richard on Avvo, a lawyer review website.